For details about local attractions, family entertainment, and how to get around Miami, check out our Local & Travel Information page. The events committee has organized several formal and informal occasions over the course of the conference. These gatherings will mix social and professional interaction. Some formal events will take place at the conference hotel during conference hours and others will be after-hours adventures into Miami. There is also information about things to do and places you can explore on your own. Planned Dinners: Look for the sign-up sheets in the registration area to join other QDET attendees at some of Miami’s hottest restaurants. We will reserve tables, so all you have to do is join us (at your own expense)! Random Digit Dining: Meet new people and reconnect with old friends! Look for your randomly assigned table number in your registration packet, and then find the corresponding table at Thursday’s lunch. Planned Dinners: Look for the sign-up sheets in the registration area for these occasions (at your own expense). There will also be a few surprise awards, so don’t miss it! Evening Cruise: Join us for a 2½-hour cruise around Miami! 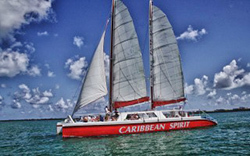 Tickets are $70 and include drinks and munchies aboard the 78-foot catamaran The Caribbean Spirit. Spouses, partners, and friends are welcome to come along. Register online through Eventbrite before October 7. Pub Crawl: Join us as we explore local gastropubs, lounges, sports bars, and Latin clubs. Have a pint (at your own expense) or simply enjoy the sights as we walk around the city. 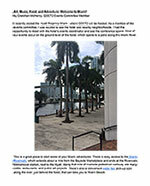 Check out the Art, Music, Food, and Adventure: Welcome to Miami! blog post for a peek at some of the places we will go. We will meet near the sign-up sheets in the registration area. Tickets for this event can be purchased onsite at registration through 3:00 p.m. on Thursday, November 10.